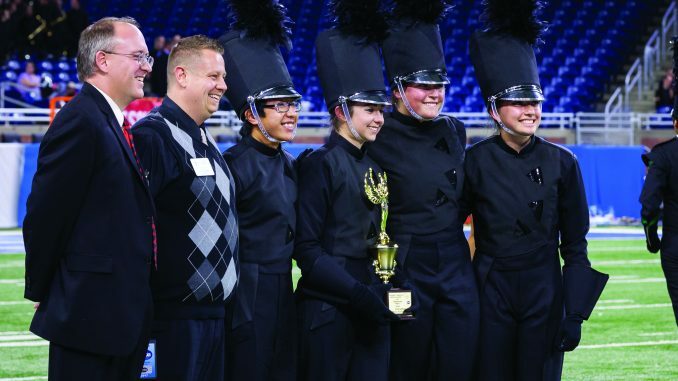 The Rockford High School Marching Band was named Flight I State Champions at the 2017 Michigan Competing Band Association’s state championships at Ford Field on Saturday, November 4, 2017. 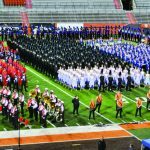 The band’s score of 94.025 was the top score earned by the 48 bands competing at the championship competition in four flights. Rounding out the top three placements for Flight I was Plymouth-Canton, 93.175 and Lake Orion, 92.750. 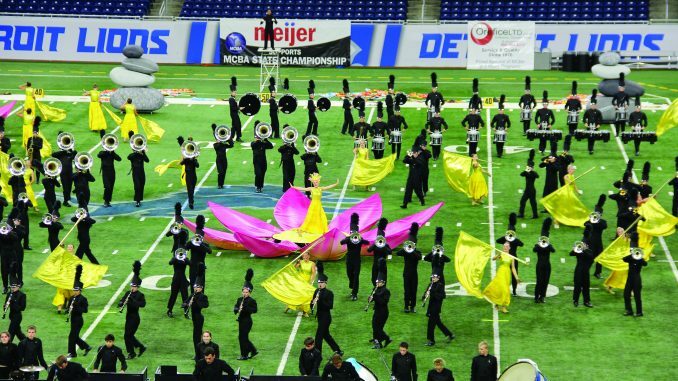 In addition, Rockford won caption awards for Outstanding Visual Performance, Outstanding General Effect and tied with fourth place Novi for Outstanding Music Performance. 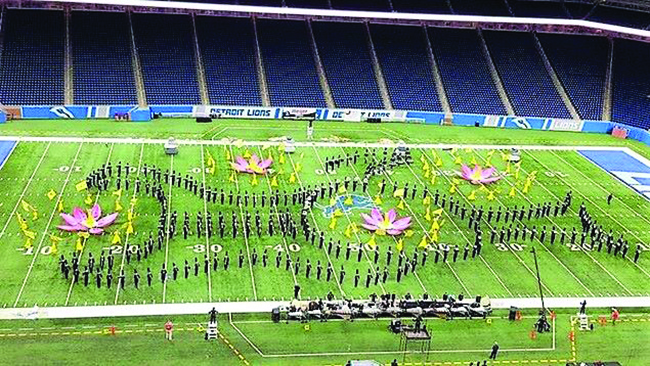 The last time a Flight I band from West Michigan took first place was 24 years ago by Muskegon Mona Shores. 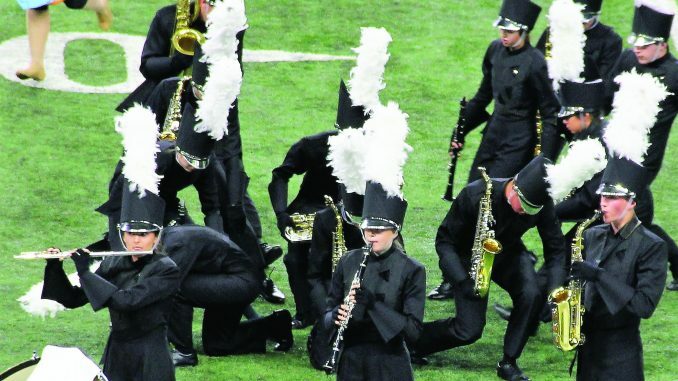 Since joining the MCBA competitive circuit in 2004, the band has faced tough competition from their counterparts on the east side of the state. 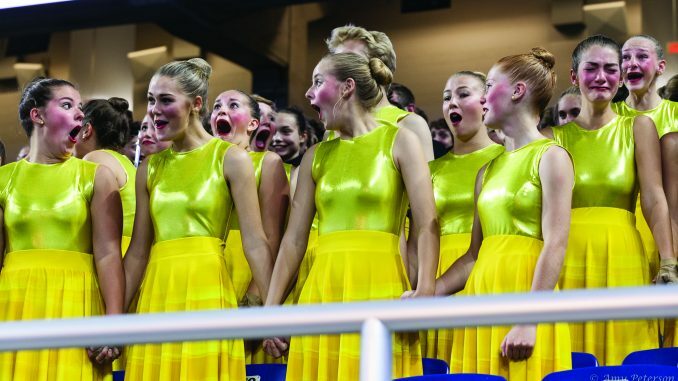 Beginning in 2009 with their show “The Four Freedoms”, the “Monday night only band”, as they were known for their one night a week rehearsal time, achieved a third place finish and maintained that position for 5 years. In 2014, they moved to 2nd place for the first time and finished 3rd in 2015, 2nd in 2016 and achieved the top ranking this year with their show “TAO”. 1. 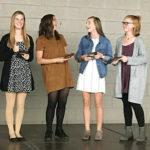 Soloists LoveLynn Richards, flute; Allison Werkema, clarinet and Asa Huffaker, saxophone are featured in the 2017 show “TAO”. 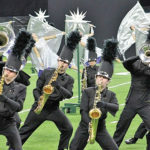 “I am extremely proud of our students, not just for their effort and performance this season, but more for their love of this art, their eagerness to improve and do what it takes to get the job done, and they’re appreciation of the other bands in our activity from which we all learn and grow so much,” said director Brian Phillips. The band’s focus will now turn to preparing for their appearance in the 91st annual Macy’s Thanksgiving Day Parade in New York City on Thursday, November 23, 2017. Television coverage of the parade begins at 9:00 am.